Which Chinese features are missing or broken in Windows 8 and 8.1? After enabling Chinese input methods by following my instructions on the previous page, if you plan to work in Traditional characters then (since you're on "Pinyin Joe's" website) you probably want to use Hanyu Pinyin instead of Zhuyin Fuhao. 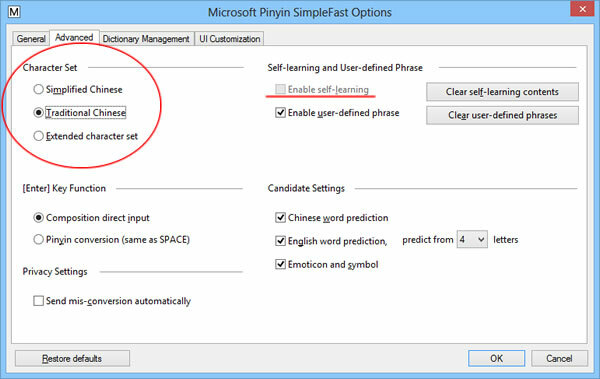 The Microsoft Bopomofo IME, developed in Taiwan and formerly known as New Phonetic until Windows 8.1, will allow you to enter Pinyin with tone numbers (as in "pin1yin1") or without ("pinyin"), and will allow you to set your underlying encoding to Big5 or Unicode. But last time I checked, the Pinyin option was not available for tablet apps! Pinyin only works on the desktop. I'm looking for a fix...please let me know if you find one first. But meanwhile it works great on the desktop. This is the most common choice for Traditional character Pinyin input outside of mainland China. Since the Windows 7 2010 update this input method has also worked in Simplified characters, but while in that mode it can't predict associated phrases (聯想), so it's best to use this input method only for Traditional characters. To set the New Phonetic IME to Hanyu Pinyin input, now that you've setup your Chinese IME(s) you'll find an input methods menu on your Desktop Taskbar. It includes an item at the bottom called "Language preferences". Select that, and you'll find yourself at the Language control panel. Another way to get there is, also from the Desktop, press <Windows>+I, select Control Panel, and then under "Clock, Language and Region" choose "Change input methods". In this case, the Hanyu Pinyin option is not even available on the tablet side, and even if you change it on the desktop side it will not work in tablet apps. I'm searching for a solution to this problem...please let me know if you find one first. Otherwise, we can only wait for the next IME update. Click "OK", then back on the Language panel click "Save", and you're done! Or are you? Those settings only show up on my RT tablet, and not in the versions of Win 8 Pro that I have installed on PCs with permanent keyboards, so for a while I was using the old-style Software Keyboard on the Desktop, which is buried deep in the old Language bar/band. I show how to enable that on my handwriting page, but if you have a tablet then all you need to do is enable the full virtual keyboard shown below. OK? Now this should work in any desktop app. Last time I checked, it did not work in tablet apps. In tablet apps, it stays in Zhuyin anyway. Please let me know if you find a solution to this before I do. Microsoft Pinyin can give you Traditional characters or an extended character set that contains both types, but at the cost of some convenience and encoding compatibility as I explained at the top of this page. 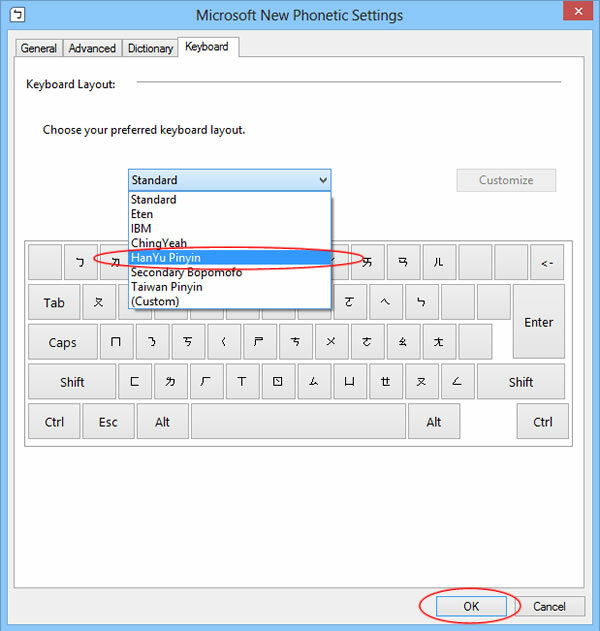 Changing this setting is simple, but there is no hotkey or other fast method to quickly switch between Traditional and Simplified after making this selection. 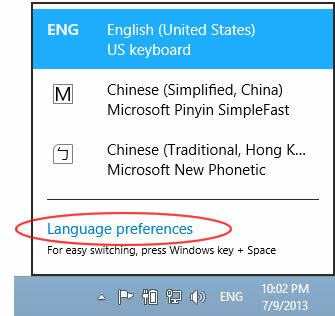 In Windows 8, you can enter the Language panel as shown above and then select select the Options for your Microsoft Pinyin (MSPY) input method as shown below. In Windows 8.1, this control panel went missing, so you'll need to go into the tablet interface to get at these feature. 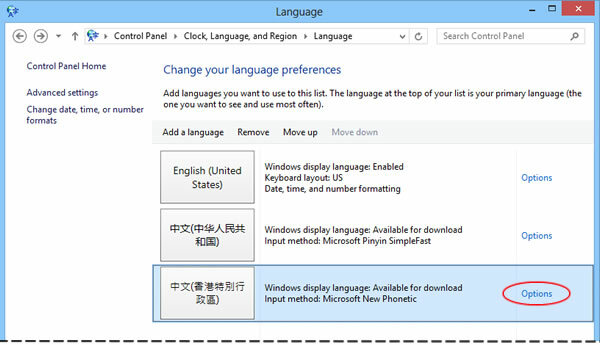 See my FAQ on missing/broken Chinese features in Windows 8 & 8.1. Note that "self-learning" (sorting candidate lists by your frequency of usage) does not work when only Traditional Chinese is selected. As of Windows 8.1 that "Extended character set" that mixed the Traditonal and Simplified sets together is gone, but I never liked it much anyway. Click or tap "OK", then on the Language panel select "Save", and you're done! • How do I enter the letter "ü" ("u" with an umlaut, the two dots above the letter)?